How many people do you know who are successful and actually love what they do for a living? Karith Foster fits that bill! Karith is a humorist, TV and radio personality, actress, inspirational and motivational speaker, entrepreneur and author. Karith is the author of Laugh Your Way to Happiness: 101 Ways to Have a Great Laugh and the soon-to-be released children’s book Lealah Finds Love. Karith is co-creator of the diversity program “Stereotyped 101″ and founder and creator of “Laughter Bootcamp” a personal development seminar that utilizes laughter and group exercises to promote stress relief, productivity and team building for individuals, groups, organizations and corporations. Karith Foster exemplifies the best traits of a new millennium leader. She is a politely independent, intellectually optimistic woman with sense of duty, service and best of all, a riotous sense of humor. The words “no” and “impossible” are not in her vocabulary as evidenced by her career path, life challenges and chosen adventures. Karith holds two unwavering beliefs. 1) That EVERYTHING happens for a reason- yes, even the bad stuff. 2) We are limitless beings capable of achieving anything. It is easy to be sidetracked by negative experiences, relationships, the media and just plain life. It is easy to let one’s background, gender, ethnicity, sexuality or life circumstance create a false and limiting belief system. The key is to remember that not only are we are in control but we have everything inside of us to attract and accomplish whatever our heads and hearts desire. Karith is living proof of this. Growing up as a very sick kid; being the only African-American in any of her classes (including college), attending the historical women’s institution, Stephens College, and studying abroad at Oxford University are just a few of the extraordinary experiences that add to her character, comedy and talks. Karith’s unique path continued when she left the comforts and safety of home in Plano, Texas for the unknowns of life in New York City. In doing so she found herself in the same room with Barbara Walters during production meetings for the hit ABC show “The View”. She’s worked in corporate America at the national headquarters of a Fortune 500 cosmetics company where she supported Senior VP’s in the human resources department and headed the company’s national Tuition Reimbursement Program, all the while pursuing a career, breaking stereotypes and gaining tremendous ground in the male-dominated field of stand-up comedy. Her comedy career has not only included headlining comedy clubs and colleges across the country, but gracing the stage of the famous Apollo Theatre and assuming the role as a sidekick for Don Imus’ nationally syndicated “Imus in the Morning” program. Karith has been and continues to be featured on national radio and television. To date highlights include making her official comedy debut on Comedy Central, having her comedy CD “Karith Foster Straight Outta Plano” in rotation and creating and producing her own radio show on Sirius/XM, as well as her own talk show, “Karith Foster: America’s Girlfriend”; Skyping with Oprah as a guest on The Oprah Winfrey Show and numerous appearances on VH-1, BET, BRAVO, NBC’s “Last Comic Standing” and “Today Show”. Karith gets nothing but pure joy knowing her story and words inspire others to create and live life to its fullest. Even though she’s only in her 30s, Karith has the experiences of several lifetimes. Because none of her successes happened overnight, Karith appreciates where she is and how she got here. She is 100% committed to sharing her secret of success, hard work and staying positive with anyone and everyone who needs inspiration and motivation. 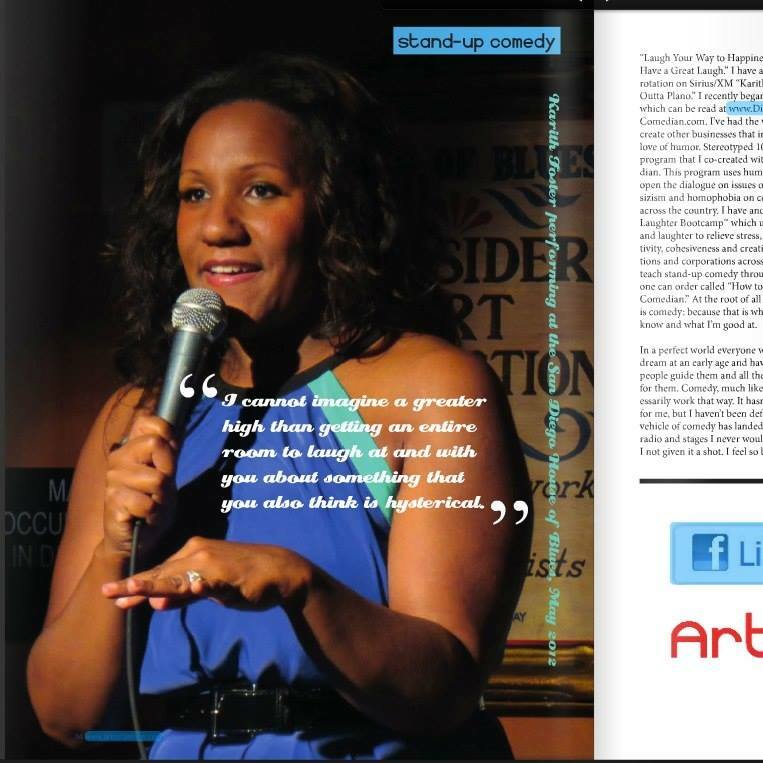 Karith Foster would love to share her insight, experiences and the gift of laughter with you.